Some of you may have noticed I have a new header. It had long irked me that in the back of the original photo, I could see a chair leg and a box. I’m sure no one else really noticed, but I did. 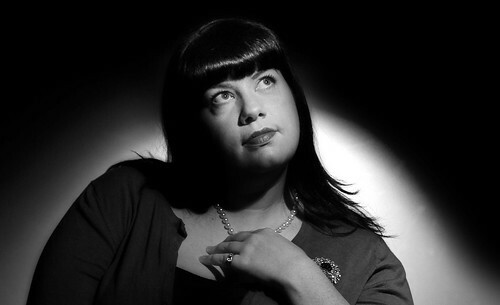 So, when the uber talented Leah Hennel (a friend and photographer with the Herald; check out her website) asked to do a 1940s-style, black and white shoot with me, I asked in return if she would be willing to reshoot my masthead. I’m really pleased with how it turned out. Looks cleaner, neater and the reds pop way more. I’d love to know what everyone thinks! I’ve included one of her b&w shots of me below the recipe if anyone is curious. Plus, I had her take a new shot for my “What It’s All About” page, which you can see here. Last fall, I drove home to the West Coast for three weeks to chill out with family and friends and take a small side trip to Long Beach. As part of that, I stopped over on Galiano Island for a night to hang out with my grandparents, who have lived on the island for almost as long as I can remember. My grandmother is an amazing gardener and cook. And, man, she knows a good cocktail. In the late afternoon sunshine, we sat out on the back deck, surveying the expanse of grass, the pond and outbuildings while sipping rhubarb-vodka cocktails. It tasted just like summer. The sour-sweet of rhubarb, bite of vodka and soda fizz was perfection. I had two. So, after I left I found myself thinking often of these cocktails and that early fall afternoon. When rhubarb reappeared at the farmer’s market this spring, I knew exactly what I wanted to do. The beauty of making rhubarb syrup is that you get the gorgeous pink syrup for drinks and the stewed fruit left behind is equally delicious. I like it over plain yogurt, but did indulge once or twice in having it with a healthy dollop of whipped cream. I also made extra syrup for a pregnant friend. 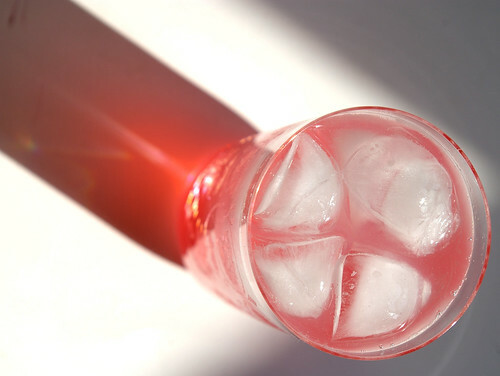 Just mixed with soda, it’s a great mocktail for the summer season. You may wonder about the name of the drink. My grandmother’s nickname (for which I have no explanation) is Foxy Lady. It only seemed right to name the drink after her. 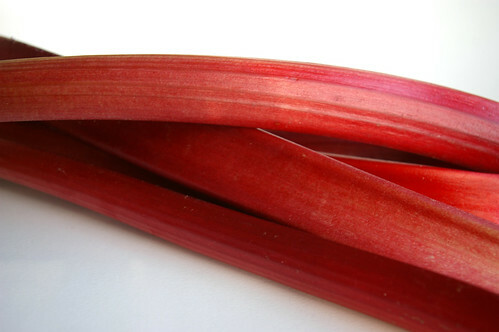 In a saucepan, bring rhubarb and water to a boil. 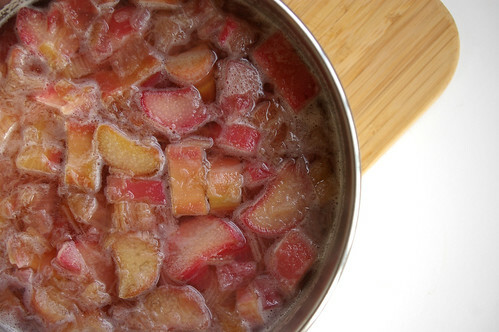 Lower the heat to a simmer and cook until the fruit is soft and the liquid is pink and slightly syrup-like. Add sugar and stir. I started with 1/2 cup. Let it dissolve for a minute and then taste the syrup. Add more sugar if desired. I wouldn’t go much more than a cup, though because rhubarb should be a little tart. 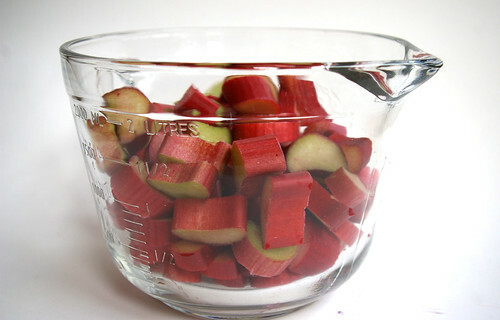 Using a fine strainer set over a bowl, separate the solid rhubarb from the syrup. Let sit for 10 minutes or so to fully drain the rhubarb. Pour the syrup into a container and refrigerate. 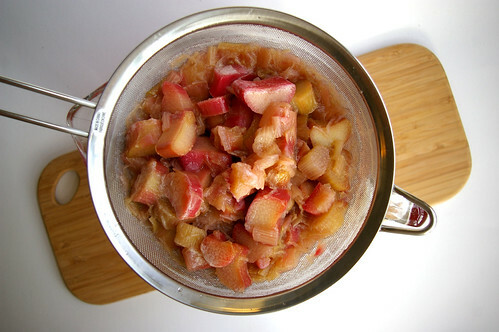 Scoop the stewed fruit into a separate container and refrigerate. 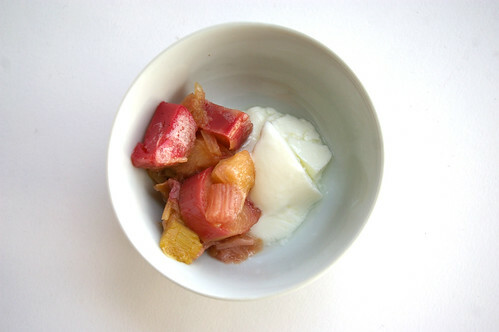 The stewed fruit is fantastic over plain yogurt or ice cream or topped with a dollop or two of sweetened whipped cream. In a tall glass, mix together the vodka and syrup. 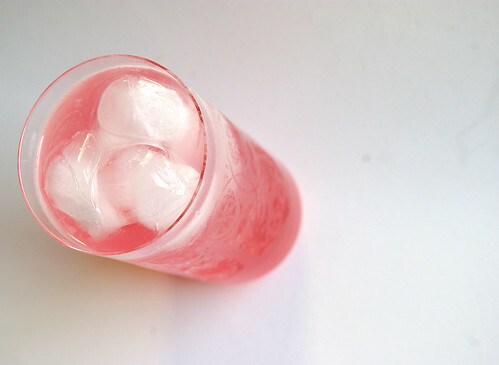 Top with soda and a couple of ice cubes. Stir gently. Serve. This also makes a fantastic mocktail if you just omit the vodka. Now I need to go buy some rhubarb. Is that bowl from Target? FWIW, I love the new header. And now I am going to eat some rhubarb. I’m sad that you felt the need to change your header, especially since I liked the old one better. It had a much more relaxed and natural feel to it. The B&W is fab. I love rhubarb almost as much as I love lemons. I miss the days when people who had it tried to give it away like zucchini. Now they want $2-$3lb at the store. Mom mom used to make and freeze quarts of rhubarb, better than applesauce! I like the new header and the other photos too. I made some rhubarb syrup too, in trying to get through 10 pounds of the stuff. It’s gone now, and I want more! 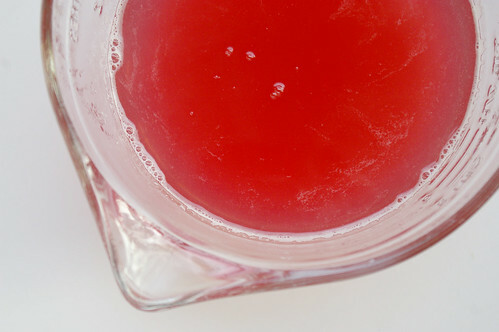 how long do you think you could keep the rhubarb syrup in the fridge? in case i wanted to make this in advance or keep the leftovers (if any!) around. But, I had divided it in half and froze part with great success. If you’re making a large batch, refrigerate what you think you can get through in a week and freeze the rest. my friend’s dad gave me some rhubarb from his garden yesterday – this was the first recipe i thought of! We have some huge rhubarb growing in our yard that I did not plant and have always wondered what to do with it. Now I am going to try this, it sounds easy enough even for me. My rhubarb is ready. Time to make Foxy Ladies! Damn girl, you look hot! also delicious with gin. true story. I’m going straight out after work to get some rhubarb! This looks like a perfect drink for a sunny weekend. I also love your new header and the b&w. I made the syrup and then the drink , which I am sipping on as I type this. Delicious. Love to see so many people loving rhubarb! I agree with the above recipee – one of my favourites is Rhuby with a small addition of smooth vidka shaken over ice and served in a Martini cup!